This is something my mom made for us as kids; comfort food at its best. My sister and I were pretty picky eaters for a while, and despite that, everyone in the family loved this dish. This variation on the theme of shepherds pie is sure to become a favorite in your home. Boil a med-large pot of water. Dice potatoes (leaving skin on half of them) and place into boiling water. Take them out when they are finished, about 20 – 30 min. Dice onion, and sauté in a large skillet with 2 tbs butter until starting to brown. Keep half of the sautéd onion in one large skillet and take out another medium skillet and put the rest of the onion in the second skillet. Add peas and corn to first skillet, put on low heat, cover, and put on a back burner. In the second skillet, add meat, and sauté until cooked throughout. Mash the potatoes, adding the salt, butter and milk. In a large dish that can be baked, pour the peas-corn-onion mixture into the bottom (smoothing it out to form one layer), then add the meat-onion mixture, again smoothing out, and then top it off with the mashed potatoes. Put in the over about 15 – 20 min or until the edges start to bubble and the potatoes start to brown. Add the butter, sugar, egg, and vanilla to the bananas. Cream thoroughly about 1 – 2 minutes. In a separate medium/small bowl, mix flour, baking soda, baking powder, salt, cinnamon, and rice protein. Grease muffin tins or line with muffin liners. Pour dry ingredients in with the wet ingredients, and mix. Add the 1/2 cup of milk. The batter should be thick but not exceedingly difficult to stir through. Add more milk if needed. If unsure, leave it. Put mixture into muffin tins, filling the cups up a little over 3/4 of the way, and sprinkle on almond slices. 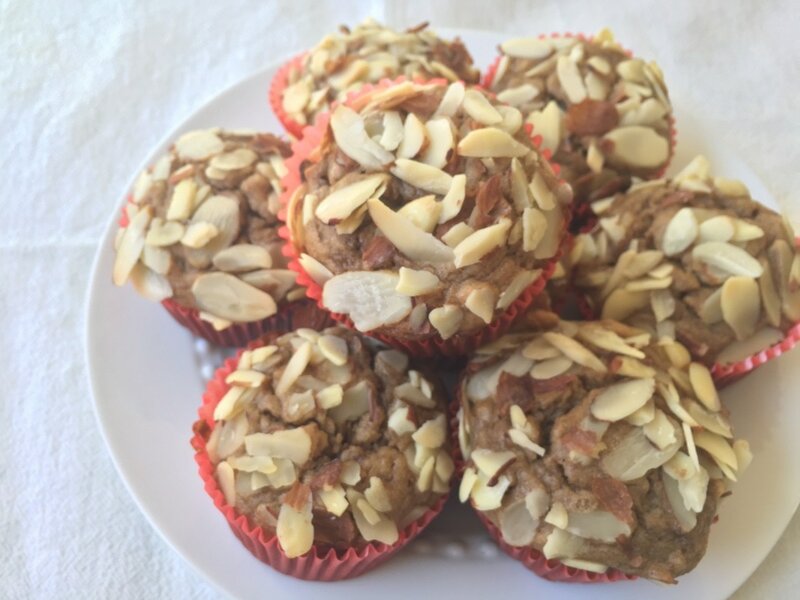 If you really want to get fancy, toast the almond slices before you put them on the raw muffins. Bake 15 – 20 min (19 min was perfect for my oven & altitude of 5,480ft), or until a knife comes out clean. Allow to sit a 5 – 15 min, then enjoy! 2 cups Medjool dates ** You don't need to use this exact type, they are simply the best tasting most moist dates. So if you use a different kind, add a tiny bit more water and oil. Remove pits from dates, and roughly chop. Put in a bowl, cover with boiling water. Let sit for until congealed, about 10 min, but it is ideal if you wait for 45 min. In the food processor, desiccate almonds until they start to become almond paste (5—10 min). Scraping down the sides as needed to evenly combine, add the soaked dates and juice, 2 tbs melted coconut oil, 1/2 tsp salt, 3/4 cup coconut flour, and 3 tbs coca powder. Allow to cool slightly (as it might still be warm from the date mixture. 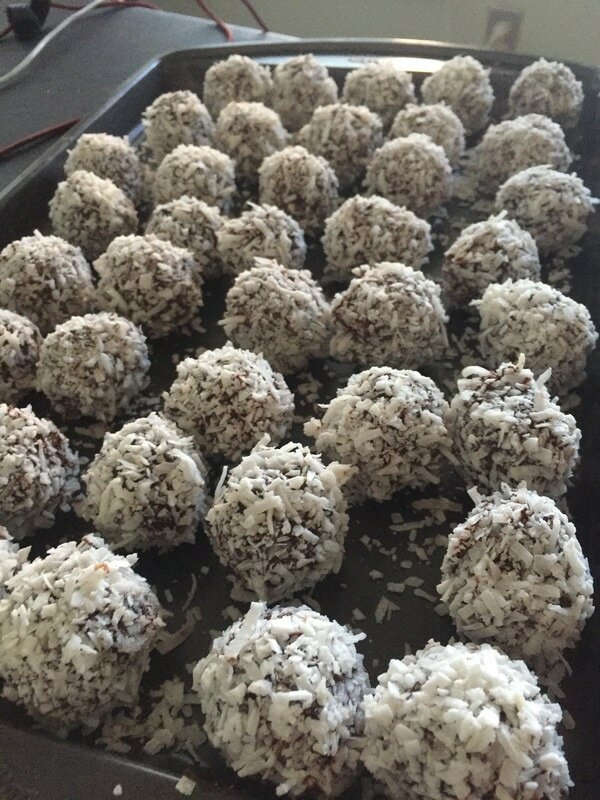 Use a 1 tbs measuring spoon and roll into balls. Set out on baking sheet. Next, cut dark chocolate into small shards and put in small bowl. Add melted coconut oil and boiling water and stir until smooth. Put the coconut on a plate. 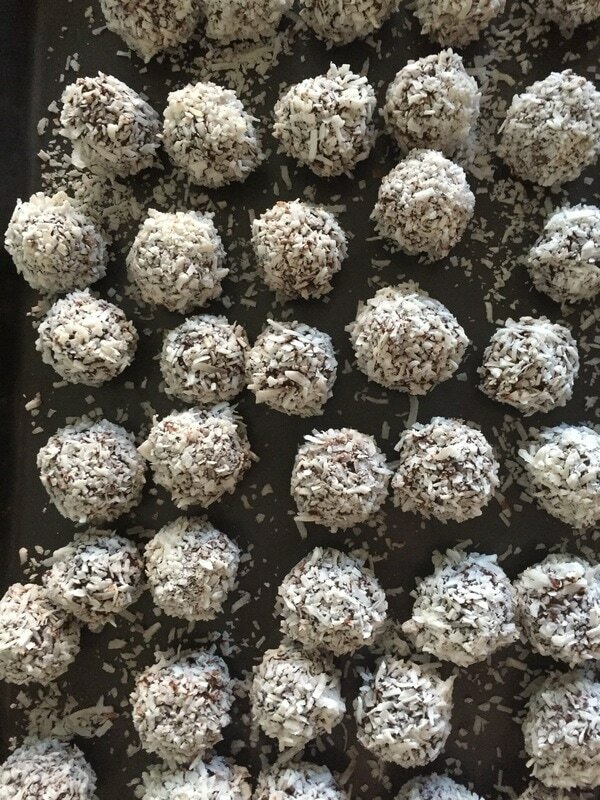 Roll balls in chocolate using two forks until completely and evenly covered, and then drop onto plate with the coconut, and roll around using two different forks until completely and evenly covered. Put on a place or baking sheet and place in the freezer. Once firm in the freezer (about 30 min) transfer to an air tight plastic container, and take out as many as you want to eat that week and put them in the fridge. 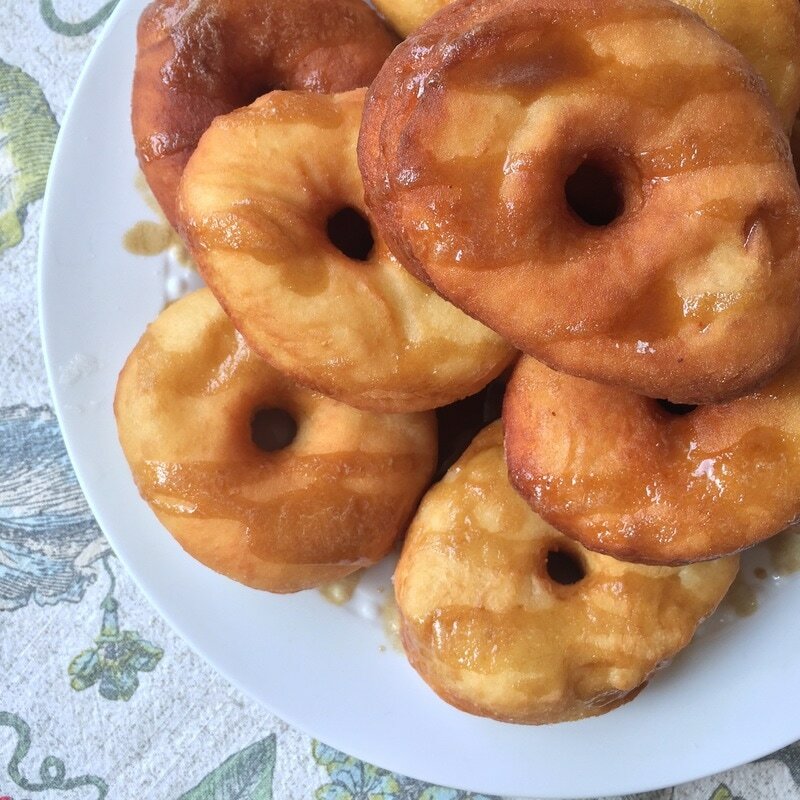 These keep pretty well, but only take our a weeks worth from the freezer at a time.